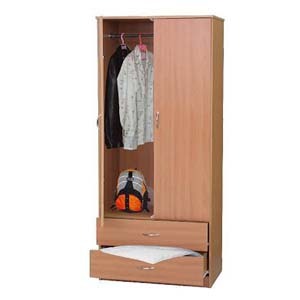 Two Door and Two Drawer Wardrobe with hanging rod. Strong Construction. Also available with The Options Below. Easy to assemble. Made of Melimen with Scratch resistant qualities. Available in White, Black, Beech and Mahogany Finish.Also Available with Full Mirror Front and Lock. -Detailed and easy to follow instruction manuals with large and clear images of the assembly process. -Consumer assistance includes free shipping of replacement parts and hardware, assemly help over the phone or via e-mail .